Several of the disciples were [by the Sea of Galilee] — Simon Peter, Thomas (nicknamed the Twin), Nathanael from Cana in Galilee, the sons of Zebedee, and two other disciples. Simon Peter said, "I'm going fishing." "We'll come, too," they all said. So they went out in the boat, but they caught nothing all night. 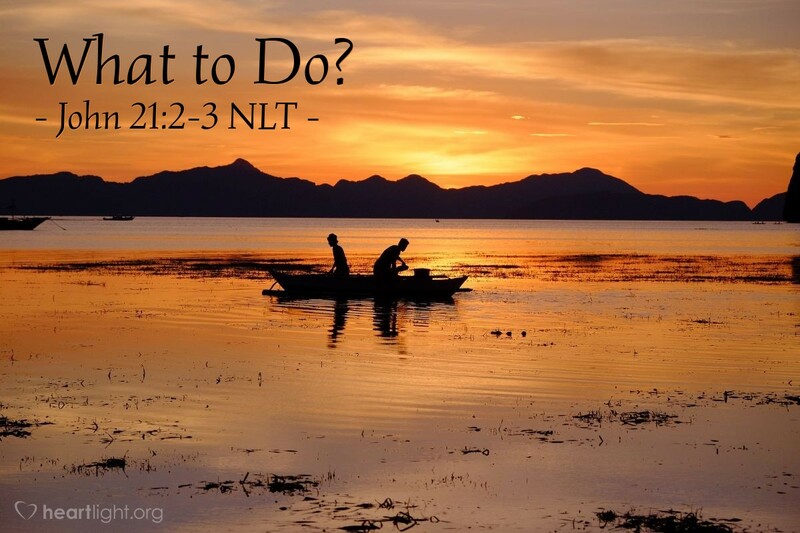 What do you do when you don't know what to do? The disciples weren't really sure what they were supposed to do with the resurrected Jesus. Their confusion was to be expected; after all, they were in new, life-altering circumstances. Two things, however, were crucial in their response to Jesus that we should notice. First, they stayed together. They knew they were bound together by something, and Someone, very significant. So they didn't let go of each other. While only seven disciples are mentioned here, we hear of the 11 remaining apostles and the women gathering with each other (Acts 1:13-14). Second, they stayed in Galilee near the Sea — a familiar place and also the place Jesus told them to go after his resurrection. In other words, when all else fails, and you're not sure what to do, stick with other believers and obey the Lord's clear instructions. Doesn't sound very fancy, but it was the key for the Lord's disciples. These two commitments helped move from despair to passionate hope and from confusion to living on mission for Jesus. Father, I confess that I often want things to be spectacular or exciting or inspiring. Yet I know that so often my sense of your presence and my most effective ministry occur when I do the next right thing that I know Jesus wants me to do and I do it with other believers. Give me a heart of obedience and a passion to be with your people both in times of group worship and study and in times of Christian service to others. In Jesus' name, I pray. Amen.